High-yield bonds remained remarkably stable during the sell-off in global equity markets and the increase in global market volatility last month, but future gains in the prices of these below-investment-grade securities could be harder to come by, analysts say. “Valuations are starting to become a constraint on further price appreciation in the broad high-yield market,” says Wes Sparks, fixed-income portfolio manager at Schroders, who is based in New York. When an issuer calls in its bonds, it pays investors the face value of the securities plus accrued interest. When prices rise and current interest rates drop below the rate on the bond, the issuer has an incentive to retire the bond and issue a new one. “That limits further capital-appreciation potential, even if credit fundamentals improve further,” Sparks says. Many lower-rated issues, such as CCC-rated bonds, are still at prices below upcoming call prices, so they still have more room to rise, he says. There are several sources of possible volatility in coming months, according to Sparks. Further rate hikes by the European Central Bank, the end of QE2 (the Fed’s security-purchase program), US fiscal policy tightening and possible further problems among the peripheral European sovereigns all need to be watched closely, he says. European high-yield spreads are expected to continue to grind tighter, while yields will gradually rise to reflect a higher inflationary environment, according to a report by Schroders. “Mixed data on the economic front will limit monetary policy tightening, leaving high-yield [bonds] attractive versus stocks, and the relative value of high-yield is also attractive versus most other fixed-income sectors because government bond yields are so low,” the asset management firm says. “We expect solid performance from high-yield bonds in 2011, with a projected total return of more than 10% for the [global high-yield] index,” Schroders says. Away from peripheral Europe, global macroeconomic data have remained choppy, says Sherif Hamid, European credit analyst at Barclays Capital in London. China’s economic data were weaker than expected, and the half-point increase last month in the banks’ required reserve ratio serves to tighten policy further, he notes. Recent data on US retail sales and European industrial production were also on the soft side. 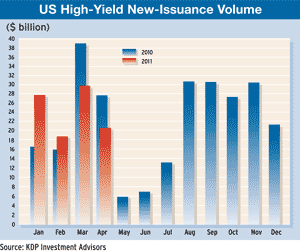 Total high-yield issuance in the US market in April was $20.6 billion, down from an upwardly revised $29.9 billion in March, according to Montpelier, Vermont–based KDP Investment Advisors. The finance arms of the major US automakers were active issuers in April. Ford Motor Credit sold $1.25 billion of seven-year bonds, as it sought to lower its funding costs. Ally Financial, the former GMAC, issued $1.5 billion in fixed- and floating-rate notes. Chrysler announced $2.5 billion of bonds to help repay the $7.5 billion it owes the US and Canadian governments.